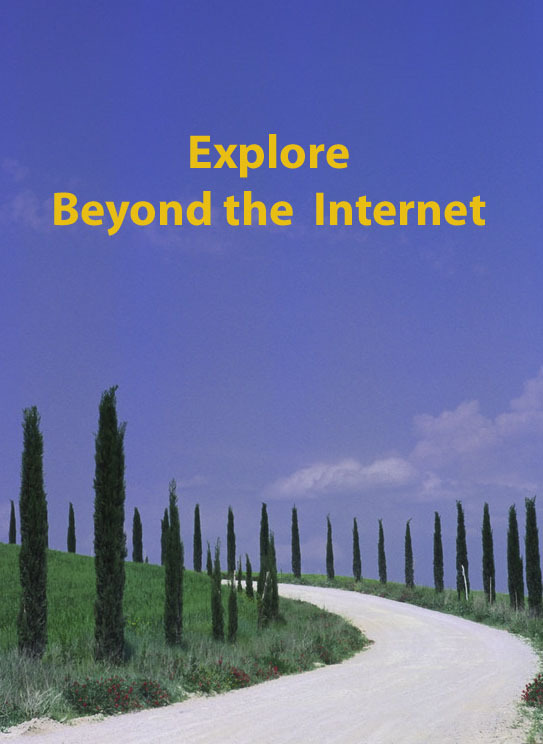 This is Week 13 in my Beyond the Internet series in which I explore the sources of information beyond our computer screens. This week’s topic is War Memorial and Plaques. I’d love it if you wanted to join in with your thoughts on this topic. 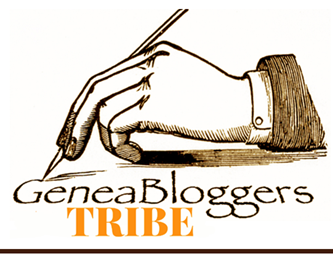 If possible please provide a link to your post on this page. Of the Beyond the Internet topics, this is probably one of the most obvious. It’s likely that if you had ancestors or relatives who served in a war, you will have tried to find some memorial to them. 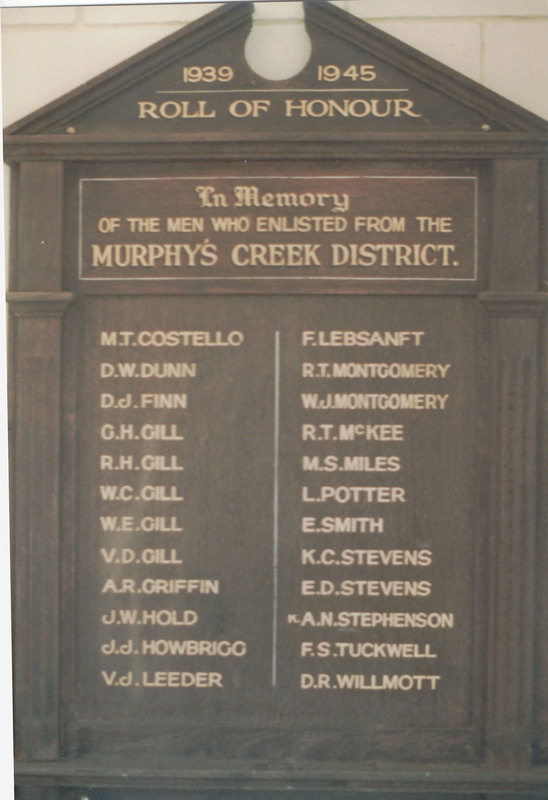 In Australia there would hardly be a town, no matter how small, that doesn’t have a memorial to the men (and some women) of the district who served and especially for those who gave their lives. Depending on the size of the town you may find the servicemen on one side of the memorial and those who died on another. There is often a commonality to the type of monument with the Digger, arms at rest, on the top. Still there are others which show a different stylistic approach. Roma's Avenue of Heroes: a row of bottle trees. The town of Roma in western Queensland chose to honour its fallen men by an avenue of bottle trees, called the Heroes Avenue. 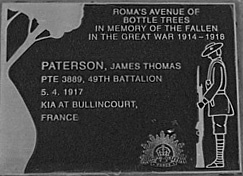 One of my grandfather’s cousins, James Paterson, is honoured in the Avenue. The historic Gallipoli Memorial near the Roma St Transit centre in Brisbane has certainly not registered with me. More recent memorials take a less stylised structure than the World War I structures. The ultimate memorial is of course the Australian War Memorial’s bronze Rolls of Honour near the Hall of Memory. How did these memorials become such an important architectural feature of our townscapes? The impact of the war affected every town, and directly or indirectly, almost every family. The Australian War Memorialsays that from a population of less than five million, 416,809 men enlisted and 60,000 were killed while 156,000 were wounded gassed or taken prisoner. 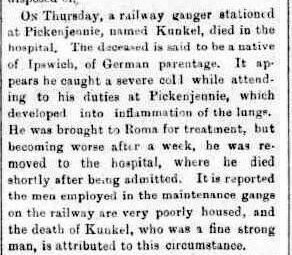 In practical terms this means that about 15 men in every hundred men served, and of these half were killed, injured etc. At the recent talk by Dr Tom Lewis, he suggested that these monuments were a way for families to honour their men-folk whose graves they were unlikely to ever see. This seems quite a logical conclusion to me, but perhaps they also served another purpose: to give the families some practical way to ensure their dead would not be forgotten. If you’re unable to visit your Australian ancestral town in person right now, the internet does provide an alternative way of seeing these memorials. Picture Australiaand Google both provide a way of seeing these iconic features. The notes on the photographs may also tell you more. 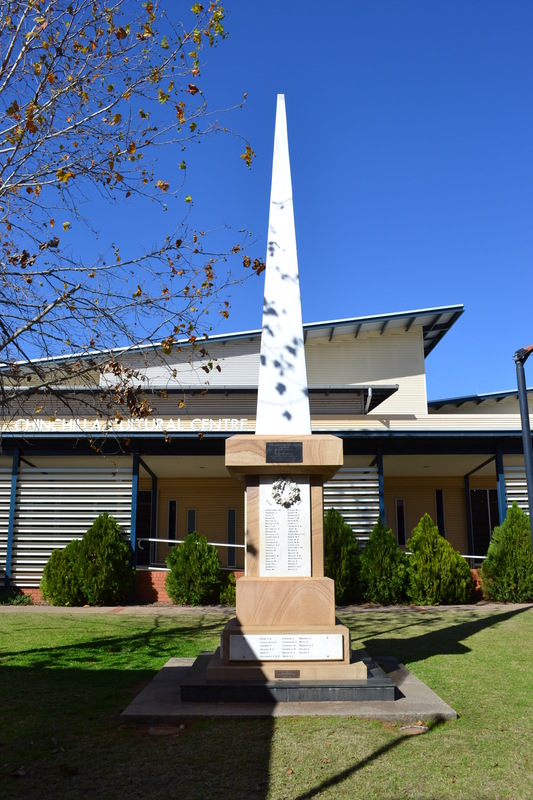 For example I’ve learnt that the War Memorial in Chinchilla includes the original base while the Digger has been moved to the RSL Club…shame I didn’t know that when I visited. The updated Chinchilla War Memorial photographed in 2011. Without a doubt using the internet to help us locate these memorials can be invaluable and we’d be foolish to forgo that complementary process. For example I’ve just found there is a huge memorial to all Toowoomba Railway employees who served in World War I: something to add to my “to do” list for the next visit. 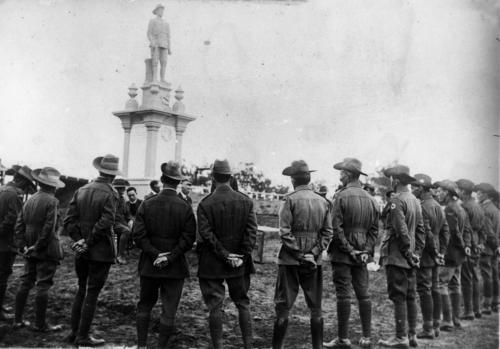 Queensland has a War Memorials Register as I’ve just discovered and it would be an invaluable tool. Other states seem to have similar resources. A word of caution: there are plaques I’m aware of that are that I’m not finding on the register. There is/was an honour board at Central Railway Station for WWI railway employees which I’ve not found in situor on the register (another “to do” activity). 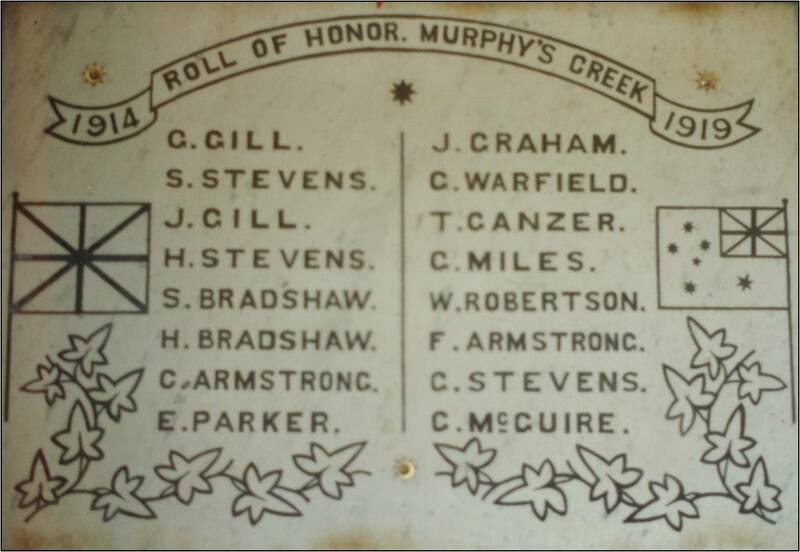 Wallumbilla’s honour board does not appear nor does the small one for Murphys Creek. 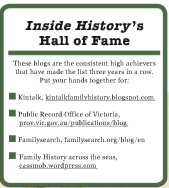 Some of these only come to light by reading local or occupation histories, and may include your relative’s name. 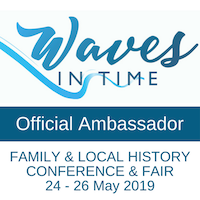 As we move into April and Australia’s remembrance of Anzac Day, you might like to research your family’s presence on a memorial, either in person, or if that’s impossible, then online. 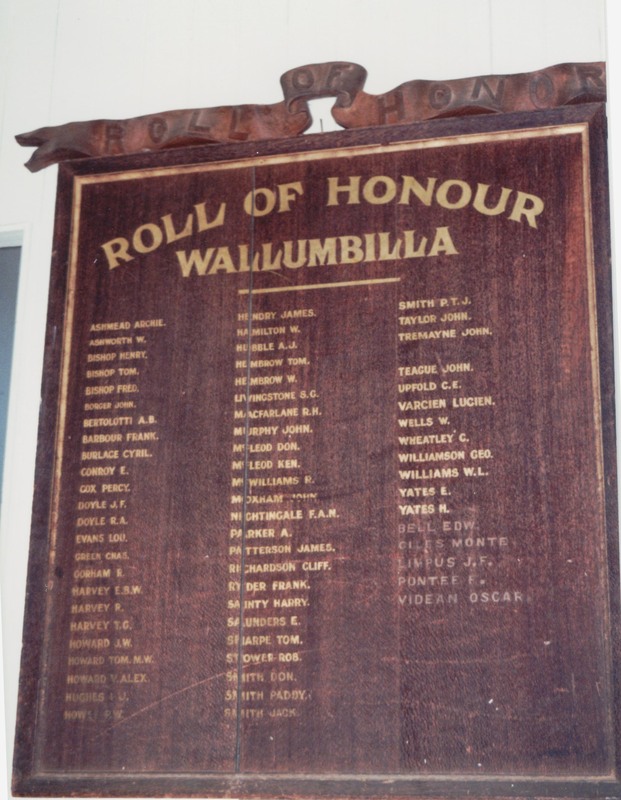 Wallumbilla Roll of Honour. 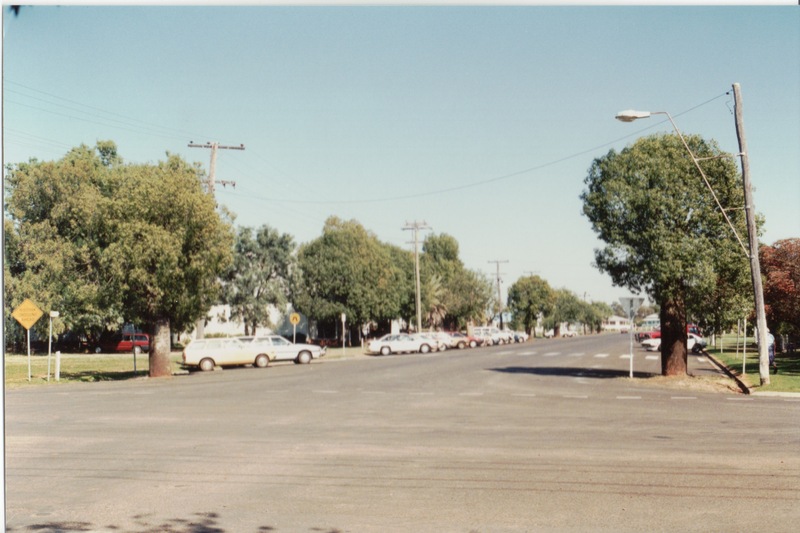 Murphys Creek is really a small hamlet while Wallumbilla is a small rural town. Despite this their wartime contributions were significant.